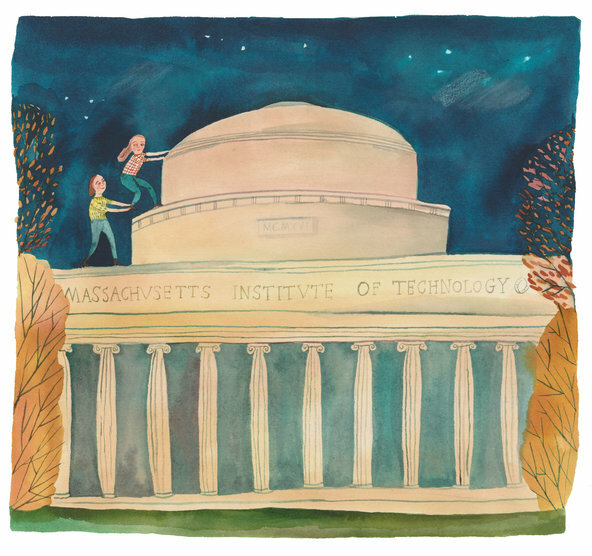 I grew up hearing stories of my mom’s grad school days at M.I.T. in the early ‘90s: pulling all-nighters in the Fishbowl, a cluster of computers off of the Infinite Corridor; writing messages to other Project Athena users on black screens with green text; sneaking through tunnels at night. Later, after dropping out, she gave birth to me. And after that, she climbed mountains in the Himalayas: Everest and K2, Gasherbrum II and Kanchenjunga. As the only child of a single mother, I stayed in Connecticut with my grandparents during her journeys, swinging on the swing set in their backyard, waiting for her to come home. But death was a real possibility in the Himalayas. I understood that much. Luckily, my mom always came back, her fleece smelling like countries I might never see. For my 18th birthday in 2010, my mom drove from Connecticut to Boston to visit me at Harvard. She parked beside my dorm at 9:30 p.m. and texted: Come outside. I met her at her car. We drove across Cambridge in her silver Subaru, not talking much. She parked at M.I.T. near the Small Dome, a structure that sits atop 10 Ionic columns. From the car, the dome looked like the surface of the moon. “Leave your ID and wallet in the car,” Mom said. We slipped through one of the building’s open doors. She held my hand as we snuck upstairs, past corridors of professors’ offices and classrooms with empty chairs. The few students we passed didn’t recognize us as trespassers. Mom took out her car key and gingerly depressed the latch. She procured a piece of duct tape from her pocket and covered the latch so that the door wouldn’t lock. The alarm didn’t sound. Without another look back, she stepped onto the roof and started walking. I was not then (nor am I now) drawn to climbing. For years I had a deep fear of mountains –– they represented an uncontrollable force, the thing that took my mother away from me when I felt like I needed her the most. But as early as elementary school, I understood that my mother’s way of healing was to seek solace in ascents and summits. Many American parents would probably say their primary responsibility is to keep their children safe, to teach them to respect authority and stay out of trouble. These were not my mother’s goals. I followed her. Late September wind gathered along the sides of the buildings, blowing my hair up and out, wrapping stray curls around my face. The late-night pedestrians under the streetlights looked like Lego figures. We trekked across a long section of the roof, turned, and stared up at the dome. The summit. Mom laced her fingers together and went down on one knee to give me a boost. I took my fingers out of my pockets and breathed on them, trying to summon some warmth. I stepped onto her hands. I kept climbing, trying to get handholds and footholds on the surface of the dome. I stopped just before the window above the atrium of the building, not wanting to feel vertigo, not wanting to test how thick the glass was. From up that high, I could see the Charles River unfurled like a wing. Stray lights reflected on its surface. The domed skyscraper on Huntington Avenue stood across the river, as regal as a Himalayan mountain –– or what I imagine one looks like. I’ve only seen pictures. The moon was full, another gray dome in the sky. I scrambled back down. We walked in silence across the roof, through the door (Mom removed the piece of tape with her fingernails), down the stairs, across the lawn, and into the silver Subaru. Only there did we collapse into laughter, relief. We’d had our adventure. No parking tickets waited on the windshield. A year ago I rode my bicycle solo along the length of New Zealand. In the South Island, I cycled to the base of Aoraki Mount Cook, the mountain where Sir Edmund Hillary’s mountaineering career began. It was there I realized that my mother’s example has allowed me to be a female adventurer of a different sort. I didn’t become a mountain climber, but for the last two years I have been traveling mostly by bicycle in the United States, Fiji, Tuvalu, New Zealand, Australia, Thailand, Laos and Cambodia. I’m halfway through a project to collect 1,001 stories about water and climate change from people I meet. Now I can see that my mom’s birthday gift to me was more valuable than the kind that comes wrapped in paper and ribbons, even though the only tangible thing she brought was a strip of duct tape. Devi Lockwood is a poet who will be attending the United Nations COP22 climate talks in Morocco in November as a youth delegate for SustainUS.